Friends of ours just escaped the frigid northeast and headed to Key West, Florida. Since we were there last year, they asked what some of our favorite restaurants and places were. One of my suggestions was to visit Dry Tortugas National Park. I must admit that if it weren't for my desire to visit every US National Park, I might not have gone there. Once I did, it became a must visit at least once spot. Located about 70 miles west of Key West, it is accessible only by boat or plane. 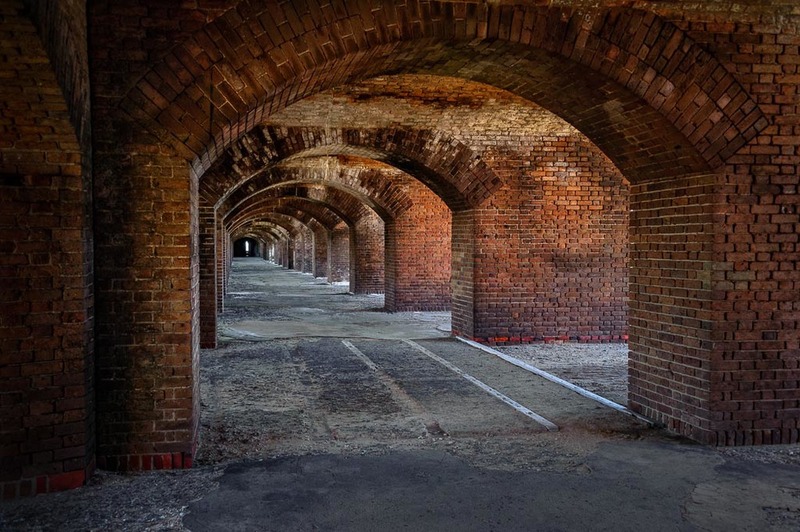 Visitors are treated to a wonderful place where they can enjoy snorkeling, explore the coral reef, immerse themselves with the marine and bird life and, if none of these things interest you, you can tour Fort Jefferson. The fort was built between 1846 and 1875 to protect the Gulf of Mexico. Like some government projects, the fort was never completed, due to the fears that the island might not be able to support the weight that finishing the fort would require. Walking around the fort and seeing the amount of brickwork there, I can understand the concern, although one would have thought that particular concern would have surfaced before starting construction. This composition shows the arches that provide the foundation for the upper levels.